My Garden gargoyle hides his eyes from hail - some of it golf ball sized, as seen at right - that fell on Hutchinson, Kansas at 4:13 PM today. My tomato plant (above left) may be asking the gargoyle "Why was I not made of stone, like thee?" 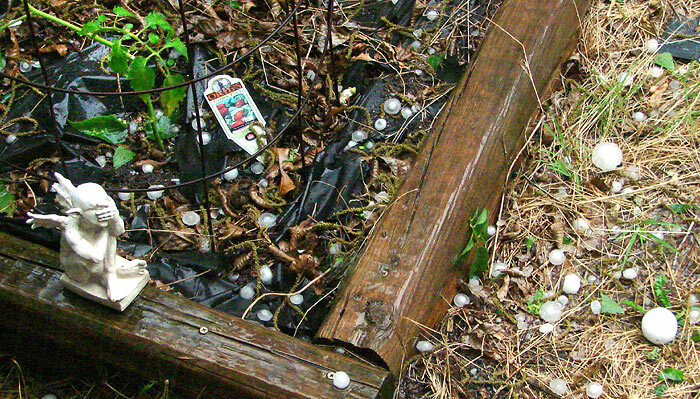 Actually, the concrete reinforcing wire cylinders I use as cages stopped much of the hail from reaching the plants, but now I have more storm damage to clean up. It never seems to end.